The Supreme Starway Gate (SSG) is the ultimate building in the game which will bring victory to the first Allianceto finish it. 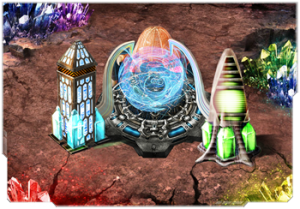 The SSG is constructed on the Team planet in the Galaxy zone, only after the three Obelisks are built and all 10 Crystals are gathered. - Total of 1 000 000 Alliance resource points on the Team planet (note that these points are separate from each player's personal Resource points). You can see the amount of your Alliance's resource points on the Alliance screen. - Construct all three Obelisks. Fulfilling all these requirements enables authorized Alliance members to start the SSG construction. The SSG requires the resources listed below and needs 72 hours for construction. Note that the time needed for the SSG construction is a constant and it is not affected by any bonuses reducing construction time of buildings.